5 shrine of a fallen warrior at the memorial service held for Air Force Lt. Col. Kenneth Bourland at Logistic Support Area Dragon here Feb. 12. (U.S. Army photo by Senior Airman Andria Allmond / SOUTHCOM Public Affairs)By Spc. A. M. LaVeyXVIII Airborne CorpsPORT-AU-PRINCE, Haiti Exactly thirty days after the devastating earthquake that rocked this country, both the Republic of Haiti and the United States of America paused today to remember those who had perished in the disaster. At Logistic Support Area Dragon, next to the American embassy, servicemem bers from six of the uniformed services, along with and Department of Defense civilian personnel, joined together to remember one of their own. Air Force Lt. Col. Ken Bourland, 37, of Birming ham, Ala., was the CaribU.S. 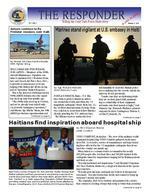 Southern Command, visiting Haiti Jan. 12 for an defense and security counterparts. Bourland was in his room at the Hotel Montana when the earthquake struck at 4:52 p.m. Jan. 12. His remains were found at the Hotel Montana here Feb. 7 after more than three weeks of search and rescue efforts. U.S. Army Lt. Gen. Ken Keen, deputy commander of SOUTHCOM and commanding general of the Joint Task Force Haiti, led a group of his peers and comrades in a memorial service, paying tribute to the fallen airman. Ken Bourland was an airman, a pilot, and a professional in everyway, said Keen. something that he loved. Bourlands wife Peggy visited the site of the Hotel Montana, met with Keen and asked him to not return home without her husband, Keen said. Keen. She also asked in the same breath, that we dedicate everyday to helping the people of Haiti and complete this mission that he was here on and that is what we do every day. We look at the children here and we see their smiles, even though they have no food, no water, and no roof over their head, but someselves to smile at us and say thank you, said Keen. He continued, we see it in the women who come through the distribution lines, as our paratroopers, Marines and airmen lift, what to some would be the weight of the world, 100 pounds of rice on their shoulders, they smile and say thank you they dont ask a lot. I ask every single one of us to dedicate ourselves as we go about our duties here, in the embassy, or out there in the cities delivering aid, said Keen, and remember those who have served and keep in mind the price that some have paid. Our nation asks a lot of our servicemembers and even more of their families, said Keen. Before the shrine of a fallen warrior: the tags that identify the fallen, the combat boots net both symbolizing a time to cease the battle and pause to remember a comrade, Marine Sgt. Maj. Louis M. Espinal, the command senior enlisted advisor for JTF-H and SOUTHCOM, stood before the formation, called them to attention and sounded role call. When Espinal got to Bour lands name there was no answer. Again, his name was called. And the third time, Bourland still did not respond. sound of a bugle playing taps and like Bourland would have wished, the mission continued. Funeral services in the U.S. were Tuesday. 6 CONTINUATIONPredatorcontinued from page 1 Holloman team chief, during a telephone interview from his deployed location. Thats a big deal for us at the 849th. This is a big deal for the entire Predator com munity because weve practiced going out in a situation exactly like this. The Airmen who support and maintain the remotely-piloted aircraft from Hol loman AFB teamed up with members of the 432nd Air Expeditionary Wing out of Creech AFB to support 82nd Airborne Soldiers and Marines on the ground in Haiti. Our crew chiefs and specialists are integrated at the individual level, Tatom said. I call it the Team Predator concept. Neither squadron could have supported this deployment by ourselves, but by and tomorrow will be better than today, board the ship. This service was important for every one who has been through so much, said command chaplain David Oravec. We wanted to start the service hope. The memorial was attended by service members, civilian volunteers, and Haitian patients who were well enough to attend with their escorts.The service included prayers and singing as well as the public reading of a letter of appreciation from a former patient. I know if you werent here, many of us would be dead, wrote former patient Leveille Valmir. The note contined on to say, This is the biggest proof of love the U.S. could offer the Haitian people. You have given us life. Prayers were lead by Comforts chaplains and Red Cross volunteer Rev. Noster Montas. Singing was lead by The Joyful Noise Choir and Red CrossComfort continued from page 1Allyncontinued from page 2 progress is being made, we are reaching more people, we are feeding families for two weeks at a time now, rather than just surviving a day at a time Allyn said the military is identifying the longer term needs of the people and the Government of Haiti Over 16 buildings that belonged to the Government of Haiti were destroyed by the earthquake, Allyn said. We have been trying to identify alternate facilities that the Government of Haiti can use to restore its governmental capacity. When asked about the militarys goals in the long run, Allyn said, Weve been going around to critical infrastructure sites like hospitals, telecommunications, power substations and providing expertise necessary to assess both the immediate damage and the long term improvement that needs to be done to restore the essential capacity of the government to govern for the people. We intend to ensure that there is a solid plan that the government is comfortable with, he said, and then we will assist in helping to identify the right capability to meet the needs for the people and the Government of Haiti. The desire to get supplies immediately to the people in need which is the overall pur pose that we are trying to achieve is something that is shared by everybody involved here, Allyn said. There is no confusion about why we are here and what we are trying to do. When asked about supply and demand issues, Allyn replied, You are going to have friction as you have a high priority need to be met, but we work through that very effectively and I think the people of Haiti feel the effects that are being delivered by the united front of the non-governmental or ganizations, United Nations, United States Agency for International Development, and the Department of Defense as a supporting and enabling arm for this effort. I was at a food distribution point yester day and there certainly was no disappoint ment in the NGO that was supporting it. USAID and certainly the people of Haiti were appreciative of what was being deliv ered on their behalf, he said. We are in the production business, Allyn said. Weve been producing capabil ity on behalf of the people of Haiti since we arrived and we will continue to do so as long as that need is there and as long as we can help to deliver the capability that is needed. The desire to help the people of Haiti, to deliver emergency supplies and capability, is something we know we can do, he said. We know we have the logistics infrastruc ture, we have the reach, and we deliver that in support of the U.S. government agencies and the U.N. agencies here very effectively for the people of Haiti. When asked about how he feels about helping the Haitian people, he said, I think I share the sentiments of every American and everyone in the international commu nity, that is, to deliver what is needed to the people of Haiti by the most expeditious means we can. Allyn said, When you see American Soldiers assisting people to provide the supplies that they need to survive and to live and to thrive, you cant help but to feel good about the compassion with which they are delivering the emergency aid, the commitment they have to do it as fast as humanly possible and the cooperation that is going on between the non-governmental organizations, the U.S. government agencies and the United Nations. This is truly is an international effort with the sole purpose of helping the people of Haiti, he said. We are here to get the job done, and we are here until they tell us our services are no longer needed, said Allyn. combining assets from both the 432nd Air Expeditionary Wing and the 849th AMXS, we are able to get the job done. The two squadrons are working hand-inhand to provide Predator sorties over Haiti daily, giving commanders on the ground a comprehensive view of the area in nearreal time. They use the capability for security, losaid. They are strictly for reconnaissance work. Because the 849th AMXS is a training squadron, the humanitarian deployment has not affected RPA operations in Iraq and Afghanistan, but has given Hollo man Airmen an opportunity to learn in a situation where the operations tempo is approximately 400 percent greater than home station training, Tatom said. Weve taken a group of individuals that are used to the one-sortie-a-day tempo that ing one 10-hour sortie at Holloman AFB and these guys have just really pulled through. POSTCARD FROM HAITI The Battle of Vertieres (in Haitian Cre ole Batay Vty), was the last major battle Haitis struggle for independence. It was fought by Haitian rebels led by Jean-Jacques Dessaline and Francis Capois against French expeditionary forces under the command of Vicomte de Rochambeau on 18 November 1803. Vertires was a French fort located in the northern part of Haiti near the port of Le Cap. The French defeat crushed their plans to restore slavery and keep Haiti as part of French empire. For Napolon Bonaparte, who had come to power in France three years before, this ing 30,000 troops to Haiti, the combat was relentless, cruel and bloody. Ultimately, the French were decimated Jean-Jacques Dessalines by fever, casualties and the effects of a British blockade which cut off reinforce ment. As Haitian leaders Dessalines and Ca pois pressed the French back, the French were forced to defend a series of fortresses (of which Fort Vertieres was one) protect ing their port of Le Cap. The Haitians outnumbered the French and their attrition attacks on the fortresses continued until Rochambeau was out tieres. The success of Dessalines forces in taking the heights of Charrier, which dominated all of Caps outer defenses, forced Rochambeau to withdraw all his forces into Cap, and on November 19 he signed a convention that delivered Cap to Dessalines. This was the last of many bloody battles in Haitis War of Independence.Haitis struggle for independence: Lt. Col. John Jay Boyd20th Military History Det.